The Langkawi cablecar brings to the top of the Gunung Macincang mountain, from where there is a good view of the Langkawi archipelago as well as Koh Tarutao. 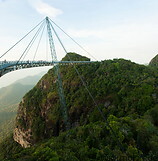 Langkawi is a mountainous island covered with rainforest. From the peak of Gunung Macincang it is possible to walk on a suspension bridge to a nearby peak from which to enjoy more views of the surrounding islands.